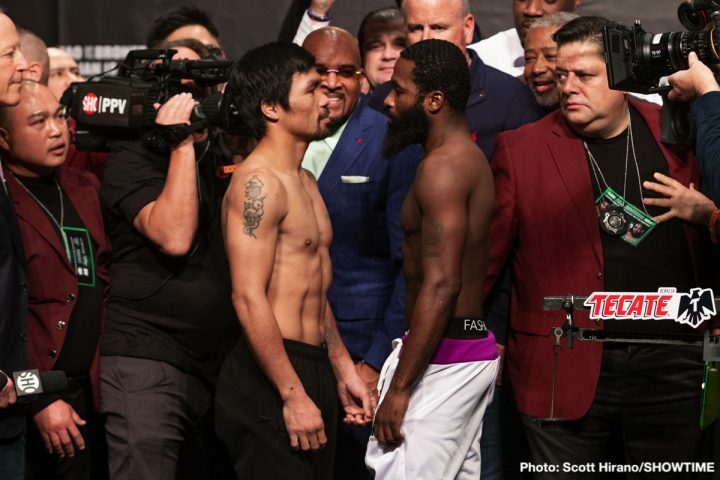 By Mike Smith: Manny Pacquiao (60-7-2, 39 KOs) weighed in successfully at 146 pounds for his title defense against the talkative Adrien Broner (33-3-1, 24 KOs) on Friday for their fight this Saturday night on SHOWTIME PPV at the MGM Grand in Las Vegas, Nevada. 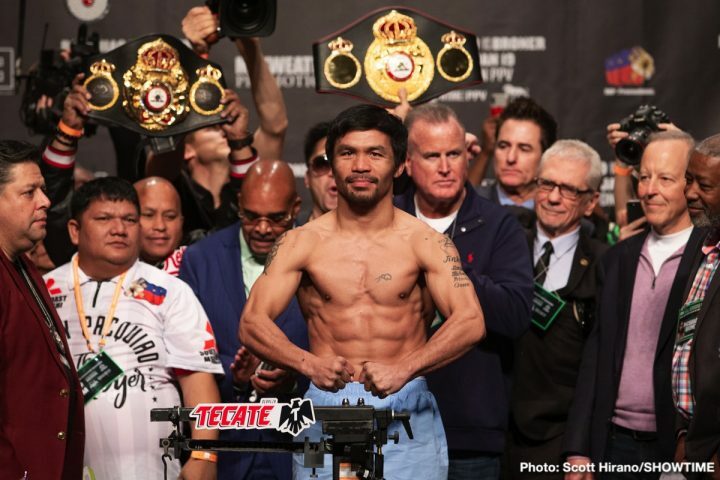 Pacquiao looked good as always. 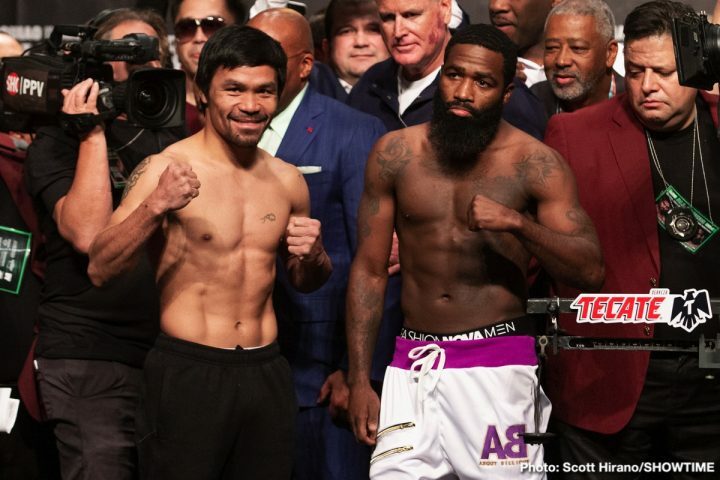 If Pacquiao brings the kind of punching power and intensity that he did in his last fight against Lucas Matthysse last summer, it could be a long night for Broner. 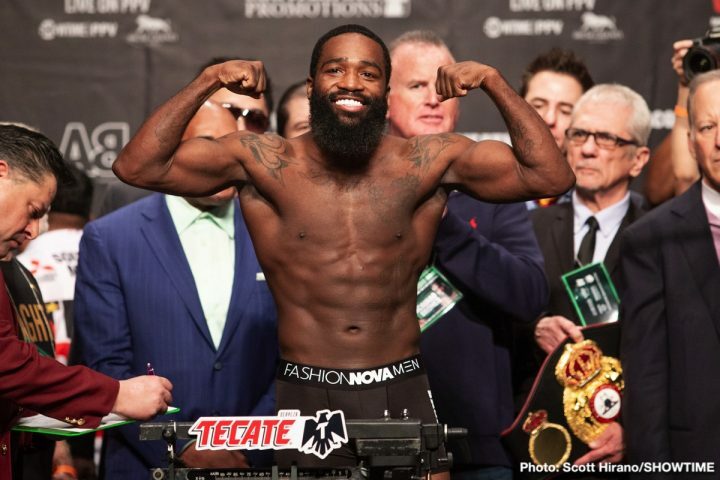 The normally very boisterous Broner weighed in at 146.5 lbs and looked in great shape. 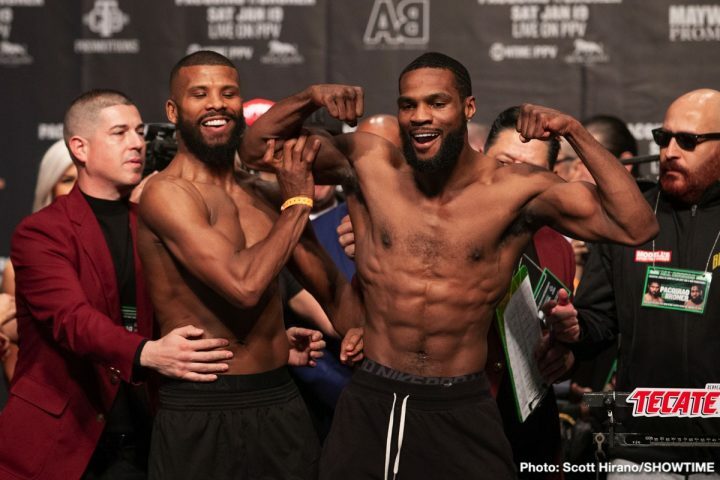 Both fighters looked lean and ready to start punching it out. 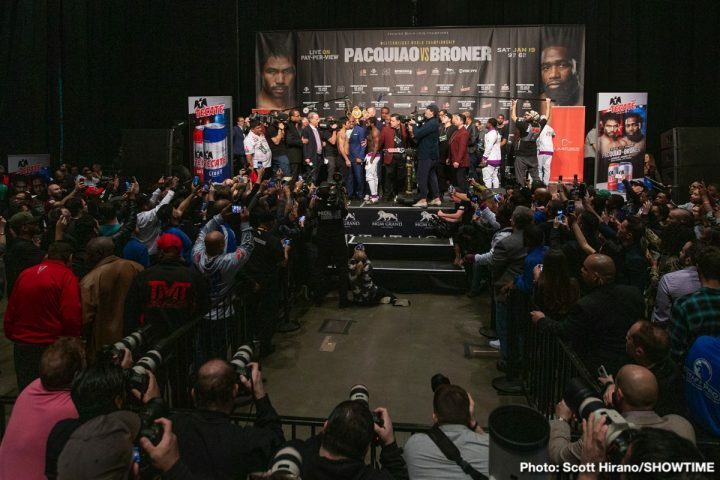 The fight will be televised on SHOWTIME PPV for $74.95 this Saturday night. 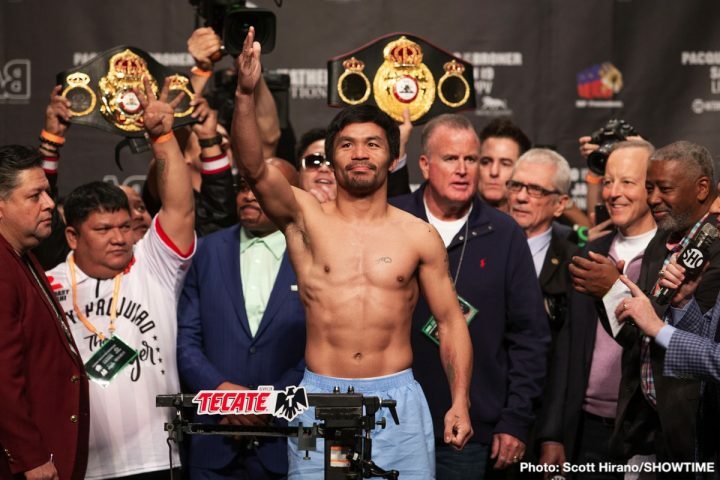 Pacquiao, 40, will have his WBA ‘regular’ welterweight title on the line. 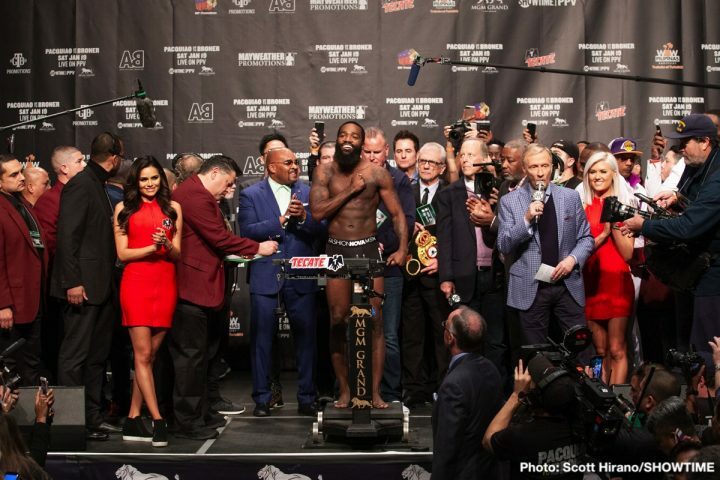 Broner will have his prime and career on the line for all intents and purposes. 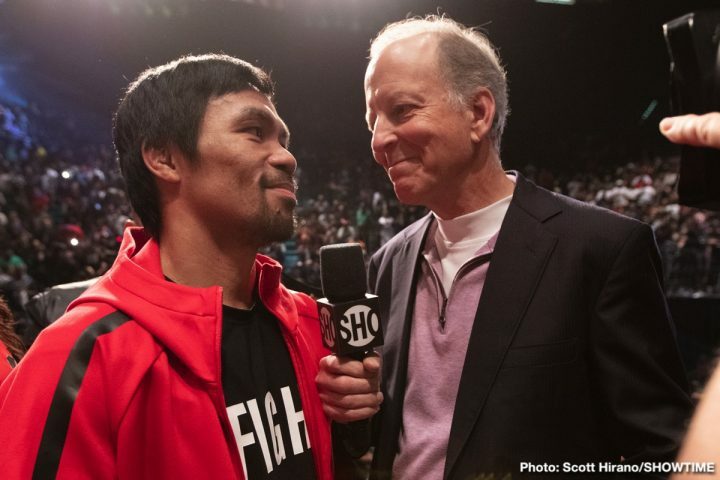 The winner of the Pacquiao-Broner fight moves on to bigger and better things. The loser will need to figure out what to do with his career. 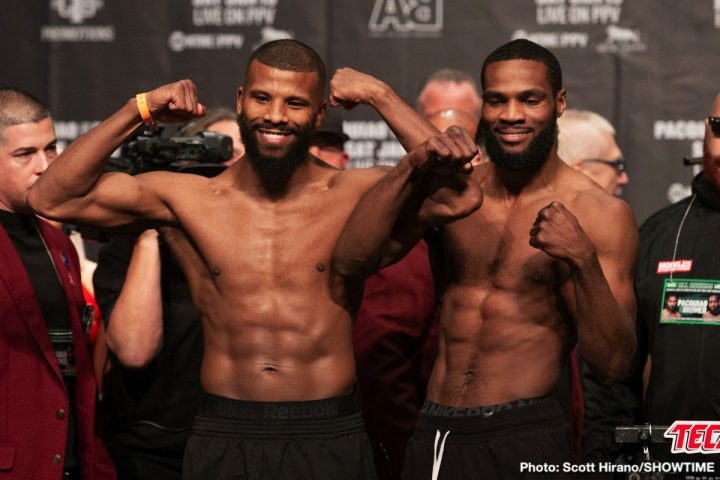 Rau’shee Warren (16-2, 4 KOs) weighed in at 116.5 lbs for his fight against unbeaten Nordine Oubaali (14-0, 11 KOs) for the vacant World Boxing Council World Bantamweight title. 2008 Olympian Oubaali weighed in at 118 lbs. 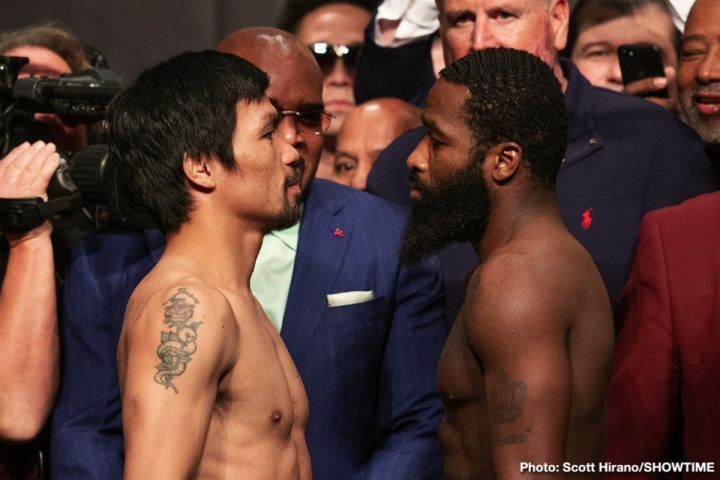 This should be a good fight. Three time U.S Olympian lost a close 19 to 18 score to Oubaali representing France in the 2012 Olympics. This will be a rematch between them. We’ll see if things are different in the pro ranks. Warren, 31, is a former WBA bantamweight champion. He held the WBA belt from 2016 to 2017 before losing it to the hard hitting Zhanat Zhakiyanov by a 12 round split decision in February 2017. Warren has since won his last two fights, beating McJoe Arroyo and Juan Gabriel Medina. The 32-year-old Oubaali got off to a late start in his pro career in turning pro in 2014. He’s beaten the likes of Iran Diaz, Luis Melendez, Julio Cesar Miranda, Alejandro Hernandez, and Mark Anthony Geraldo. 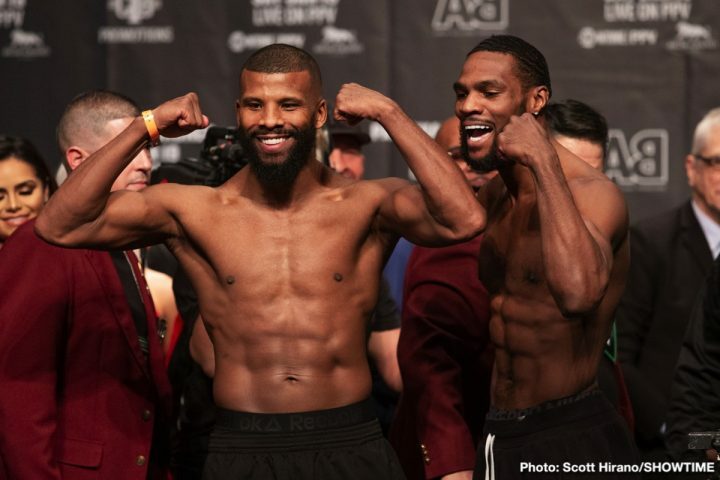 Former two divsion world champion Badou Jack (22-1-3, 13 KOs) weighed in at 175 lbs for his fight against unbeaten 2012 U.S Olympian Marcus Browne (22-0, 16 KOs) for the vacant World Boxing Council silver light heavyweight title. 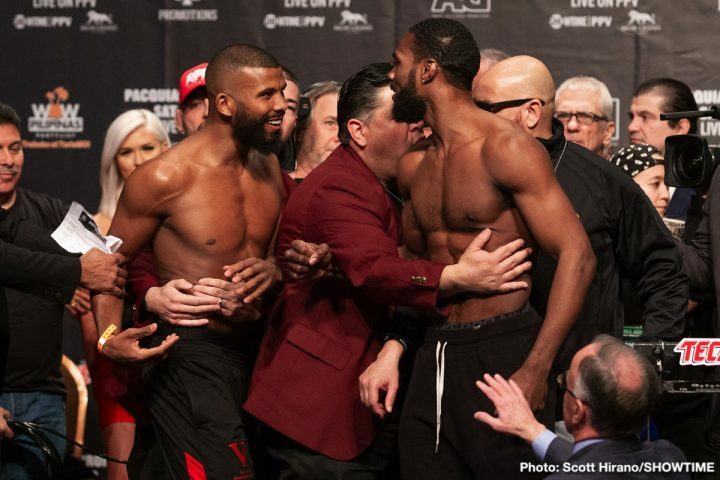 Browne, 28, weighed in at 175 lbs a well. The winner of the Jack vs. Browne fight will be the new WBC mandatory challenger to WBC 175 lb champion Oleksander Gvozdyk. Jack, 35, is coming back from a hard 12 round draw against former WBC light heavyweight champion Adonis ‘Superman’ Stevenson from last May. 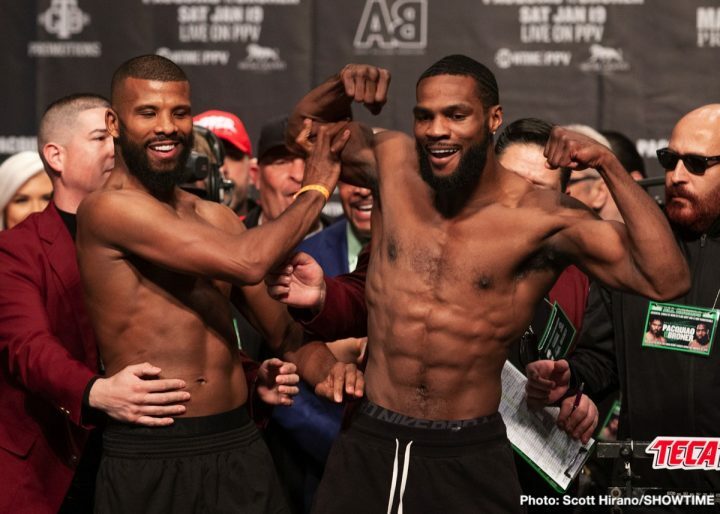 Facing Browne immediately in his first fight back from that one won’t be easy, as he doesn’t have much mileage on the tank due to the way his management has matched him since he turned pro in 2012. Jack has a very good chance of winning this fight based on his superior experience as a pro. Browne hasn’t cut his teeth against the upper echelon level fighters as of yet. 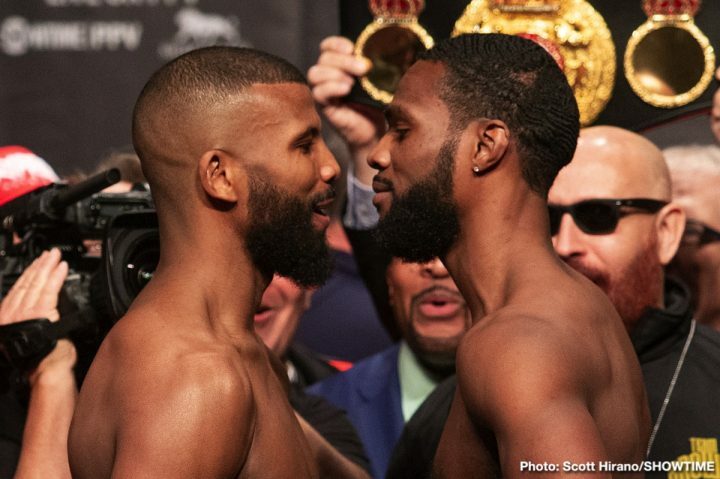 This could be a positive for him though, as he’s not had to take the punishment that Jack has had in his tough fights against Anthony Dirrell, Stevenson, George Groves, Lucian Bute and James DeGale. Jack has been in with a lot of tough fighters in a short period of time during his career. Browne has been doing very little in comparison.